FSR has expanded its HDBaseT range of solutions with the introduction of new 5-play transmitters and receivers at InfoComm 2017. FSR’s new HDBaseT two-gang Decora style wall plate, based on HDBaseT 2.0 technology, is a true HDBaseT 5-Play device that transmits HD Video (up to 4K at 60Hz 4:2:0), audio, bi-directional control (IR and RS-232), Ethernet, two-way USB 2.0, and power via one Cat-6A cable out to 100 meters. The front of the wall plate features an HDMI in and VGA video in (HD-15 female) with audio in (1/8-inch mini jack), analog audio in (1/8-inch mini jack), an IR reader window, as well as input selector and display buttons to select inputs and control the display/projector via RS-232 or CEC control. The HD-HPCUWP-Tx is designed to work with FSR’s HD-HU-SP-Rx 100 meter HDBaseT 2.0 HDMI and USB Receiver model and receives its power from it as well. It can work with any of FSR’s other 100-meter receivers, but must be used with FSR’s HDBaseT 2.0 USB compatible receivers to fully utilize the USB functions. The rear of the wall plate contains an HDBaseT RJ-45 port as well as captive screw terminals for +12V in for applications where the wall plate can be powered locally instead of via the HDBaseT Receiver. Based on HDBaseT 2.0 technology, the HD-HU-SP-Tx and HD-HU-SP-Rx are true HDBaseT 5-Play devices that transmit HD video (up to 4K at 60Hz 4:2:0), audio, bi-directional control (IR and RS-232), Ethernet, two-way USB 2.0, and bi-directional power via one Cat-6A shielded cable out to 100 meters. Installers can select USB host or device settings on both the TX and RX, and the units can be powered from either end as well. There is also a separate unbalanced analog audio input on the TX unit and an analog audio output on the RX unit. This audio signal travels on its own dedicated channel of the HDBaseT signal separate from the HDMI embedded audio signal. The HD-HU-SP-Tx and HD-HU-SP-Rx provide solutions where users may want to have USB 2.0 access to control PC sources via KVM, or work with interactive displays, media servers, or data storage devices. The HD-HSC-SP-Rx is also a true HDBaseT 5-Play device that receives HD video (up to 4K at 60Hz 4:2:0), audio, bi-directional control (IR and RS-232), and Ethernet via one Cat-6A shielded cable out to 100 meters. 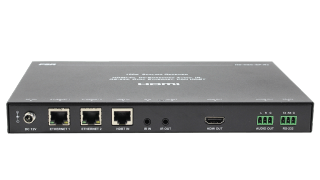 The built-in scaler is HDMI 2.0/HDCP 2.2 compliant and can be remotely controlled via API. The HDMI out has built-in CEC control and the HD-HSC-SP-Rx can be set to automatically send out CEC or RS-232 commands to turn on the display when it detects an input signal. There is a de-embedded balanced audio output as well as two Ethernet ports, which also allow Telnet control of the device. The HD-HSC-SP-Rx does need to be powered locally but it can remotely power any of FSR’s other 100-meter HDBaseT wall plate transmitters or non-scaling transmitters via the Cat-6A shielded cable.